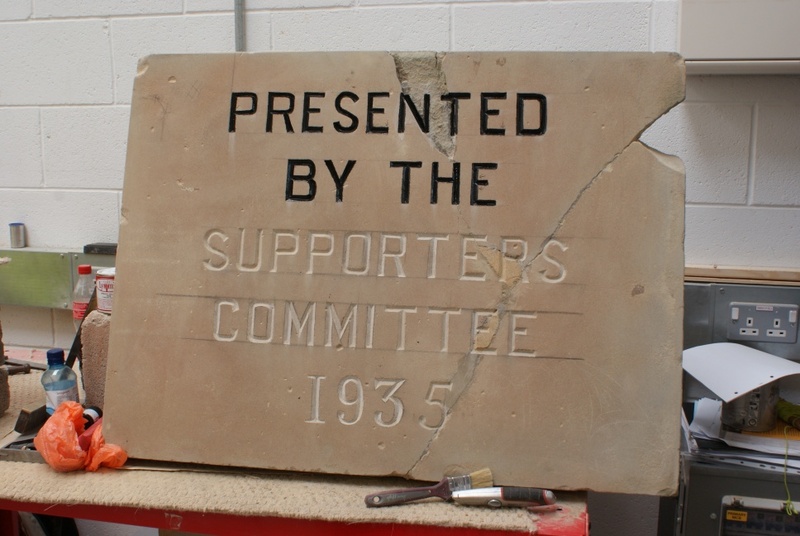 Last week I went along to West Cheshire College to see how work on the Supporters Club plaque was progressing. In fact the stone is now almost finished and they are currently painting the letters. The department estimates that it will need between one and two days to complete the job although you need to bear in mind that restoration work can only take place once a week. We have been looking at a location for the plaque and hope to install it on the wall between the player’s entrance and the ticket office window, close to the supporter’s bricks. There is a small piece missing from the right hand side of the plaque and stonemason Altomont Townsend thought it would be better to leave this rather than patch it up. I am in complete agreement with this as it serves to emphasise the restoration work that has been performed. Altomont also pointed out to me the symbolism in the broken plaque and the football club with the repair and return of the plaque imitating the work that the supporters have done in re-building and restoring the new Chester FC. It also acts as a strong link with the supporters from the 1930s who did so much to help the club in their early years in the Football League. As well as spotting the paintwork on the lettering, which would have only lasted for a few years, Altomont also had some interesting theories on the making of the plaque. First of all he thinks it would have been made by someone associated with Clegg’s who were based in Bumpers Lane (no relation to tannoy announcer Robbie Clegg). They were the only stonemasons in the city but went bust in the 1970s or 1980s. It is also likely that the engraving was done by an apprentice, perhaps a Chester supporter, rather than by a professional stonemason. He bases this theory on the fact that he identied one or two flaws in the original work and it is certainly possible to spot that the five in the year does not quite match up with the rest of the date. If anyone has any further information on the original making of the plaque then Altomont and myself would be very interested to hear from you. This entry was posted in Grounds and tagged Chester, Chester College, Sealand Road, Stadium by kwchas. Bookmark the permalink.